Preparation time: the entire process from grinding the meat and cooking will take about 3 hours. Put the pork and fat into a large bowl, add the wine, garlic, pepper, ground coriander, curing salt, water and pistachios. Mix well with your hands and cover and marinate for 2 hours. Grind once with a 1/8 inch meat grinding plate. To roll or stuff in casings? Option #1 With a sausage stuffer stuff in to 4, 10 inch long hog casings and tie at each end. Then age and cook as above. Option #2 Divide the mixture in four equal portions. Form and press each half into a sausage about 8-inches long and 1 1/4 inches in diameter. Take care to press the mixture firmly enough to eliminate air bubbles, which would result in air holes in the sausages. Wrap individually in plastic wrap, twisting the ends to enclose the sausages as tightly as possible and then roll each of them in aluminum foil, twisting the ends of the foil. Refrigerate for at least 3 days to cure. The curing process is like marinating, the enzymes with the garlic work in combination to increase the flavor. The very important part of poaching these sausages is to do it at a low temperature for a long time. This makes a big difference in the taste and juiciness of the meat. Bring a pot of water to between 150 and 160 degrees F. Lower the wrapped sausages into the pot, and place a heavy plate on top of the sausages to weigh them down in the pot and keep them immersed in the water. Cook in the same temperature range, checking the pot occasionally, for about 1 hour, or until the internal temperature of the sausages is close to the same temperature as the water, about 155 degrees F. To keep warm, let the sausages sit in the hot water until serving time. I was constantly testing the temperature of the water with an instant read thermometer, increasing heat, decreasing heat and adding cold water to keep it in the heat range. I probably did this 12 times during the hour. Note: You may shock in cold water and then refrigerate and reheat as needed when you want to use them. 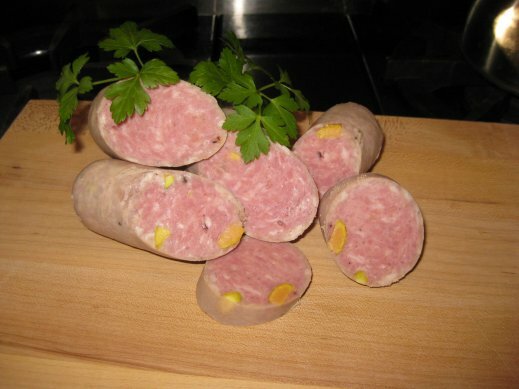 The sausage can also be served cold with mustard and cornichons. Note: Morton Tender Quick is a curing salt composed of 99 percent salt, 1/2 % sodium nitrate, and 1/2 % sodium nitrite. If you use regular salt the sausages will be fine to eat but will be gray in color rather than the pink color achieved with the curing agents. If using plain salt, also use 1 tablespoon.